Dieses 3 Schlafzimmer Private Waterfront Family Vacation Home ist bei 184 Princeton Shores Blvd., zwischen dem Blue Mountain und Collingwood. Es ist gut für vier Jahreszeiten Spaß entfernt !! Die Küste hat einen sicheren Sandstrand zum Schwimmen im Sommer. • Nur wenige Minuten vom Blue Mountain Resort und dem Intrawest Village entfernt. Die Skipisten sind 310 Hektar Skifahren von 51 Liftanlagen. Sie verfügen über einen vertikalen von rund 720 Meter zum Skifahren und Reiten. Sie werden 2 Funparks und Halfpipes 2 finden. Our stay was great! Eric and his wife were absolutely great to rent from. They were very friendly and helpful. Beautiful place right on the water to enjoy! I would recommend this place to everyone. We arrived at the cottage with our puppy on Aug 24 and left Aug 31/2013. We had a terrific time and amazing, hot weather. We spent a lot of time in the water with our pup who simply refused to get out at the end of the day and she had to be bribed out with treats!! The cottage was comfortable with ample space and very, very peaceful. We've never 'cottaged' before and so had no idea what to expect and so packed our whole home, so to speak, of everything imaginable we could think of that we would need in way of dishes, glasses, pots and pans, cutlery, etc., only to find that Eric and Rhonda Bell had it well stocked of everything one might need! The sunrises were simply spectacular. There were 4 swans out in the horizon at all times but they seemed to always come so much closer to shore to be close to us when we were in the water! This seemed to be an everyday event which made our holiday all the more special. There was lots to do outside of the cottage as well which we took advantage of - view of scenic caves, ziplining, tee canopy walk, Wasaga Beach, mini putt, go karting, etc. Overall, we had an awesome time and time seem to go by ever so slowy which was a good thing. We had a wonderful stay here and plan to make it an annual thing! It was the perfect layout inside the cottage/chalet. Just the right amount of space for a family. Plenty of space in the kitchen for company and with it backing right onto the side deck; it made BBQ'ing easy and convenient. The flat land leading towards the beach was perfect! Plenty of grass to run around and play or even fly a kite. The beach was nice to just sit and relax with a coffee or maybe do some fishing for carp or small mouth bass. It was our morning ritual. There's also a 2nd beach about 2 minutes further out that we loved. You could walk out 150 feet and still be only shin deep in water...the water is also much warmer there as it is so shallow. Also an even better spot to fly a kite with the kids or maybe plunk your beach chair in the water and have a drink. The location was fantastic for what we wanted. 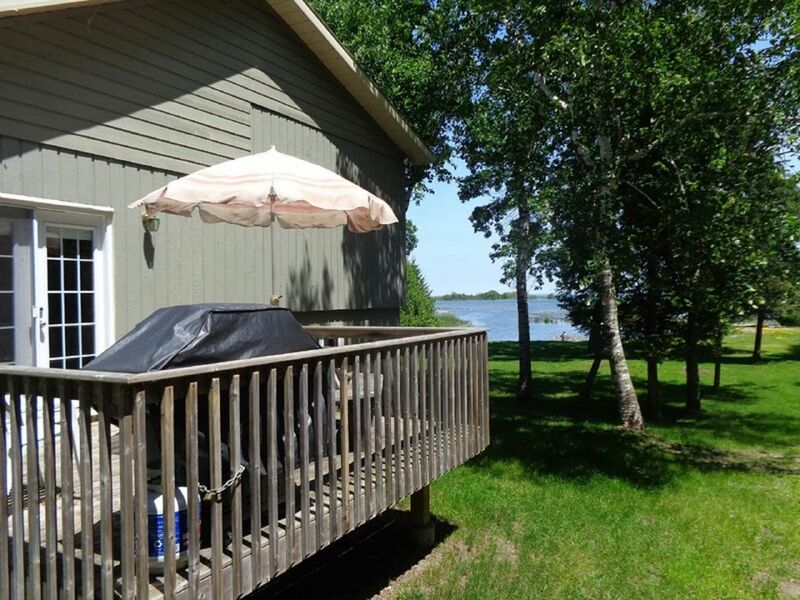 It very much has a "getaway to nature" feel, but you are only a 5 minute drive from town should you want a Starbucks/Tim Horton's coffee or need to do some grocery shopping. That was one of the best features for us. We are not "deep in the bush" kind of people. Even for one of the rainy days we had, this place was great for relaxing indoors, playing a game or maybe even watching some TV. If I must list something that could be improved about this otherwise great getaway...I think it's definitely time to replace the couches in the living room. They felt extremely old and oh so very used. I know when you rent a cottage that you're not the only person to have rented there, but sometimes it's just nice for that not to be so obvious. There is absolutely nothing else I could think of that would improve the overall experience, it's a great place with very friendly and helpful owners. Oh yeah, another plus was seeing a deer in the back while watching a movie at night...what a nice touch that was. Thank you again for a wonderful week, it was exactly what we wanted. Thank you for choosing our Collingwood waterfront cottage to stay at this year. We do appreciate you sending us your review and your comment about it is time to replace our living room couch has been well received. We will look into replacing it this year. We are very happy to have repeat customers like you each year. We stayed at this cottage this past Canada day weekend and we had a great time! The property location was perfect and well maintained. You are only minutes away from all major amenities. We would definitely recommend this cottage, Owner was very helpful and quick to respond to any question we had. We recently stayed at this cottage and really enjoyed it. There was plenty of room - we were 3 families all with children. There was a big backyard for the kids to play and the bay was right in the backyard. We were able to watch the Canada Day fireworks from the backyard over the water. We would definitely recommend this place.